Last month at the SXSW Interactive Festival in Austin, I had the honor of helping my friend Jean Russell launch an exciting new ebook called Thrivability: A Collaborative Sketch. Inspired by Seth Godin’s collaborative ebook What Matters Now?, the book contains short essays and images by 63 big thinkers, each focusing on a word or short phrase that has to do with creating a more thrivable world. Contributors include some of my favorite thinkers, such as Clay Shirky, Beth Kanter, John Hagel, Kaliya Hamlin and Tony Deifell. The book is available online as a slideshow, a PDF, and a website. Please give it a read. Share it via Twitter, Facebook, etc. And join the conversation. Here is my own contribution, a meditation on the word “exclusion.” It appears on page 30 of the book. I’d love to hear your feedback. Ouch! Exclusion is such a harsh word. What place could it possibly have in a world that’s open, inclusive, and thrivable? But exclusion can also be healthy and life-affirming. For individuals, that may mean choosing your conversations more wisely, lightening your load, de-cluttering your mental and physical space, eliminating distractions and focusing on what matters most. It means making space for solitude, contemplation, attention to yourself, to your breath, to nature, to being fully present. Exclusion is not a choice of whether to exclude, or not, it is a choice of what to exclude. For groups, healthy exclusion means creating safe containers in which to share and collaborate more deeply. It means being intentional about who and how many you want to share space with. It’s about creating and protecting sacred space. A good host has a talent for appropriate exclusion. It’s the social artistry of choosing who you want at the party, and who you don’t. Every marketer knows that exclusion is a powerful tool. Done well, limiting access to a place, a group or a product makes it cool. Anyone who has launched a new online community can tell you that early on exclusion is vital — to set the tone and model the kind of interaction you want. It’s a way of establishing a new culture intentionally. Exclusion can be about useful constraints, which spur creativity, whether you’re answering an essay question on a test or innovating new products. Imagine, for example, a candle. What is a candle without a wick? Without light? Without heat? Without wax? Such a thought experiment can help you identify which properties are intrinsic to something, and think creatively about novel ways to reproduce them. Exclusion is part of evolution, particularly the conscious evolution we are living through now. It’s about casting off outmoded, destructive ways of thinking and being. And it’s absolutely essential to a thrivable future. I’ve already gotten some great comments on this piece. One friend suggested “discernment” as an alternative to exclusion. I like that. It has much less of a negative charge to it. But that charge is part of why I find the term exclusion provocative. I like re-framing terms in ways that shift their charge. Another friend suggested a different frame: pruning. For a tree to thrive, it takes pruning, which means making healthy choices about where to cut back so you can channel its growth in positive directions. Being a leader is a lonely and difficult business, says Chief Oren Lyons, of the Onandaga Nation. The toughest part is often dealing with the people closest to you. If you can stick to what you know is true and face the inevitable attacks that come from your family and friends when the going gets tough, you will have passed one of the true tests of a leader. 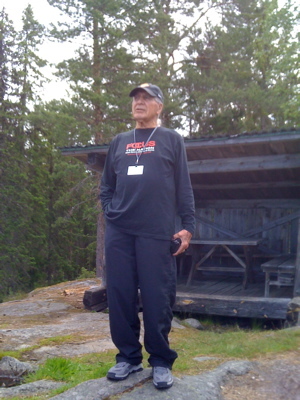 It’s the second morning of the Tällberg New Leaders Program, and we’re huddled around the Chief’s feet as he regales us with his reflections on leadership, gesturing grandly out at the sweeping view from our perch on a rocky hilltop high above Lake Siljan. He reminds us to think like the Iriquois, who always consider the effects that any decision they make will have on the next seven generations. And by seven generations, he says, they mean seven entire lifetimes — nearly 500 years. That’s thinking long-term! He urges us, too, to stand up and speak out for nature. Pointing to a large pine tree nearby, he reminds us that it took hundreds of years for that tree to grow, yet a chainsaw could take it down in the blink of an eye. It will take great leadership to save these trees. I don’t wear the “leader” label comfortably. There’s something intimidating about being called a leader. What or who am I a leader of? I don’t run an organization. I don’t have employees. I don’t hold public office. I’m a salesguy for a small software startup. Sure, we’re building online communities for organizations and movements that represent hundreds of thousands, if not millions, of people. But the buck doesn’t stop with me. I would almost rather the New Leaders Programme were called the New Leadership Programme. Still, I accept that I am a leader in certain ways. I can speak powerfully about things I care about. And at least some people listen. People do turn to me for advice and opinions on a variety of issues. And I’m a good networker. I have a talent for connecting people to each other to facilitate collaborations that sometimes yield powerful results. Plus, 20 people sponsored me financially to help facilitate my participation in the NLP. So at least they think I’m a leader, or that it was worth investing money in developing my leadership potential. I’m going to keep chewing on this question. I’d really appreciate your thoughts on the matter. Who are your favorite leaders? Why? Do you have any favorite books or resources on leadership? Please share them in the comments below.